We have had two weeks of glorious sunshine here in Wales…it’s as if the dog star Sirius has positioned himself, in the heavens above my little patch of the world a little earlier than expected. The risk of frost has well and truly passed, and with longer days there comes more sunshine and time to be pottering around on my allotments. Well I say ‘pottering’… that’s not anywhere near the truth! I was rather late planting this year, after taking on plot 4A. I spent months digging. It’s done. Finally. Everything is more or less planted too! All I need to do now is a little ‘fine tune weeding’ to completely finish plots 4A and 5A…simple? Mmmmm, no not really! Plot 5B suddenly came up for grabs and I grabbed it! I’m now the proud occupier of plot 5 (whole plot) and plot 4A. I know, I know, I’m a glutton for punishment but I really wanted a ‘Tea Shed’! 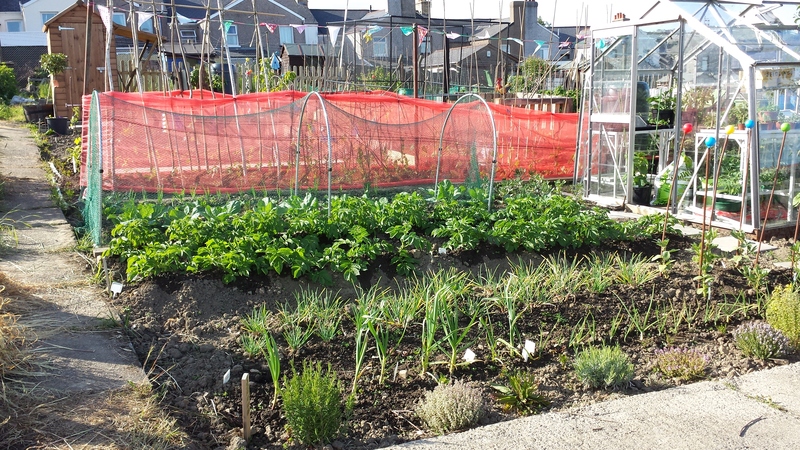 Docks, rosebay willow herb, grasses, seeded onions, brassicas and bindweed… a right royal mess! In the background, you can just see my little blue ‘Tea Shed’. 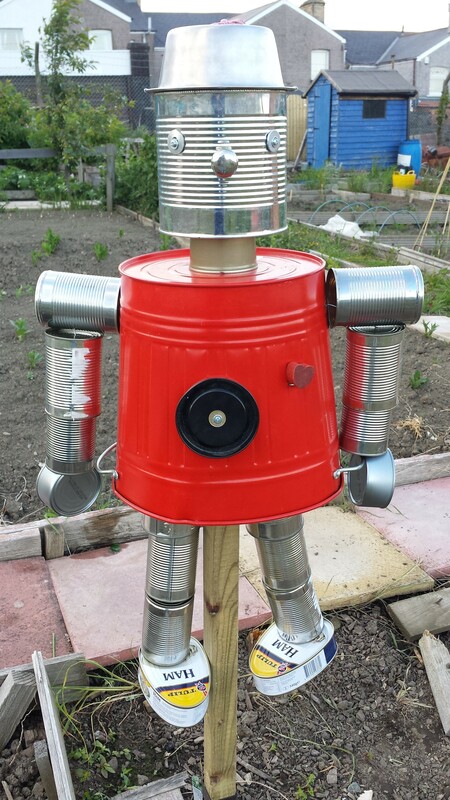 I want to avoid weedkiller so we’re planning to use a paraffin burner to literally ‘cook’ the weeds to death! I can see my ‘other half’! I’m not sure what to do about my lollipop fence now…keep? or remove? or even put in a little gateway? Oh…and we have our first froglet in our little pond 🙂 Happy Dog Days! ♫ ♪Speckled Frog Eating Delicious Slugs ♪♫…Fingers Crossed! Finished frog pond complete with Percy (a gift from my parents) the plastic frog. Apparently one third of our natural ponds have disappeared in the last fifty years which has had an enormous impact on wildlife, particularly, frogs, toads and newts. Luckily, amphibians aren’t fussy…they’ll occupy anything from a water-filled bucket, to a fancy-pants wildlife pond! So creating a wildlife pond, no matter how small, is a great way to do your bit for the neighbourhood’s wildlife. We bought a cheap moulded plastic pond from our local aquatic centre. 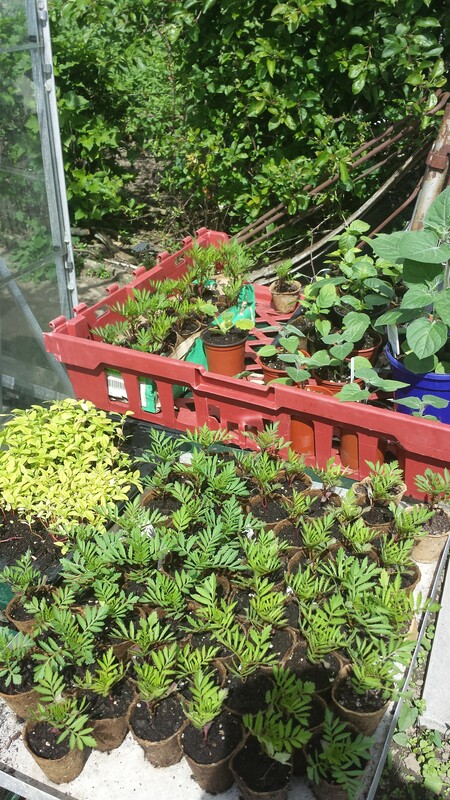 Providing an area to home frogs on the allotment could also help reduce the effects of the predicted invasion of slugs this summer. I need all the help I can get as I’m not using slug pellets… I’m passionate about keeping my plots organic! My wonderfully kind and helpful family dug over the frog bed and sunk the pond. Also the Tiddlers A, E and C are fascinated by bugs, worms and mini beasts. In fact Tiddler E and C are totally in love with everything ‘frogs’ (especially poison dart frogs!) so with this in mind I set about creating a frog pond on the plots. Nearly done…after collecting rocks and stones from around the allotment. I’m told that it is best to allow animals to arrive at your pond naturally, although I was tempted to deposit some ‘study’ tadpoles to the pond (I’ve resisted). I’ve been assured that frogs will travel over a kilometre to find a new pond, usually within the pond’s first year. In the meantime, I’ll be happy if a dragonfly (or two) or even a few water boatmen drop by. Tiddler A inspecting our handiwork after adding a few more edging stones donated by my parents. It’s a Saturday and it hasn’t rained!! Whoo hoo!! Obviously I had to make the most of the opportunity and grab a few hours on the allotments. 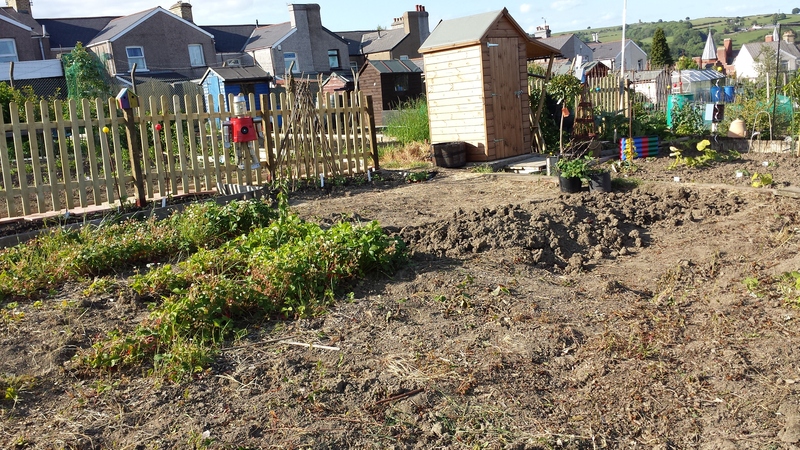 Plots 4a and 5a are coping quite well with the appalling winter weather, but the clock is ticking and I need to get the plots ready for the growing season. The 3rd raised large bed needed to be erected and filled. Put weed suppressant on the paths between the beds. I have a second mini bed to take up tomorrow (if the weather holds) and I need to buy some bark chippings for the paths. I must admit that when I took over plot 5A January last year, I was 100% against having raised beds on the plot, even though for some reason, it seems most new gardeners grow their vegetables using raised beds. It’s fashionable at the moment! Gardening magazines and programmes are full of raised bed images (and adverts). Allotment Site. A mixture of methods! However, I like the look of veggies planted in rows. I love the watching the experienced allotmenteers, use traditional methods to produce plots bursting with tasty goodies. Every possible space is used for growing! Last year some of my ‘ground grown’ vegetables weren’t entirely successful. Carrots for example…they grew. Yes – but were very misshapen! 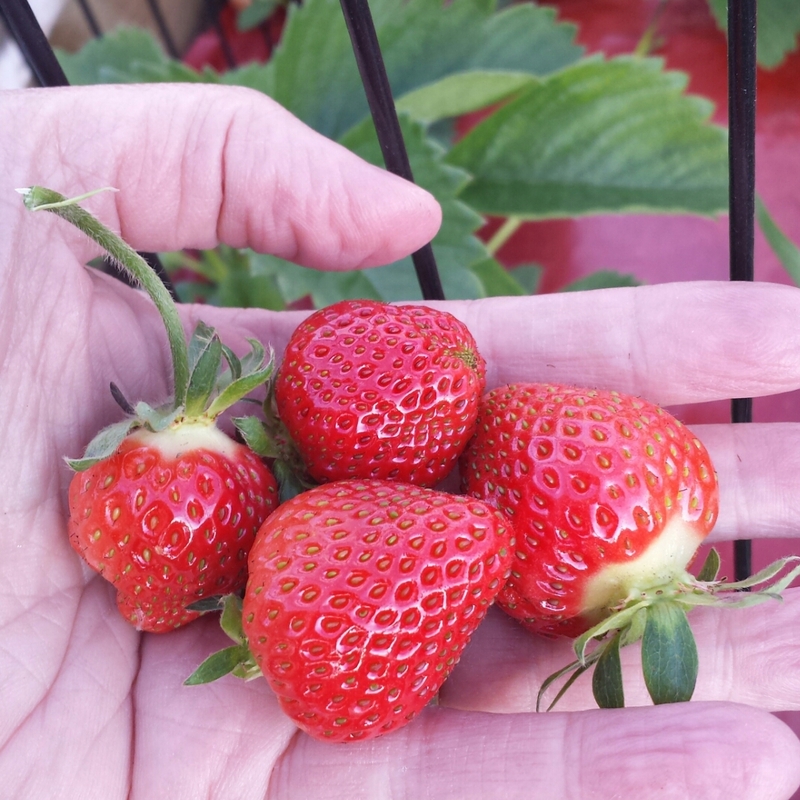 I tried growing a batch in the mini raised bed and the results were fantastic!! My cauliflowers grew nicely but were nibbled to nothing by tiny slugs! So frustrating!! 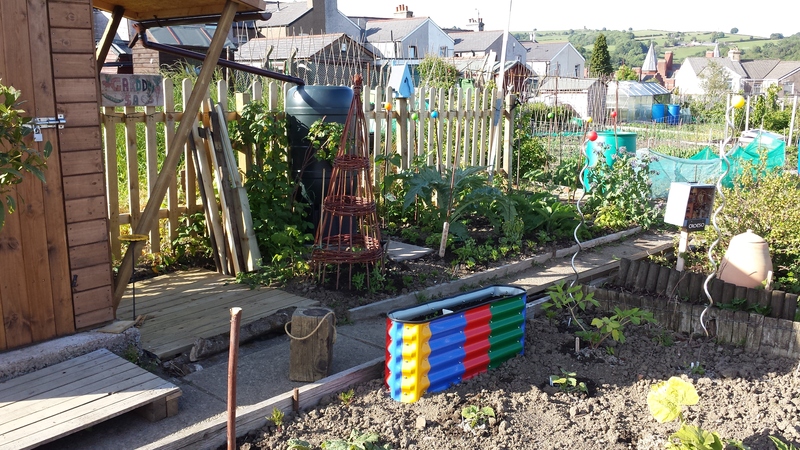 For me raised bed gardening seems like another useful trick up my allotmenting sleeve. It would be absurd not to give it a go… I have enough room, with two plots, for the best of both worlds. Who knows, my ‘chosen veggies’ may actually enjoy being snuggled up in a nice warm bed! Plot 5A has been planted up and is ticking away nicely with simple watering and weeding daily plus the occasional feeding. 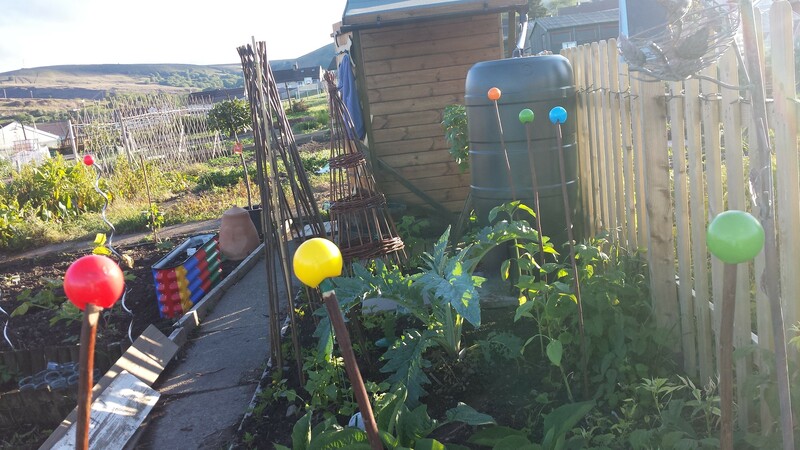 However I’m a glutton for ‘punishment’ – I’ve taken the over grown ‘hell of a state’ allotment, 4A, next door. I couldn’t resist!! I really did need more room, honestly! 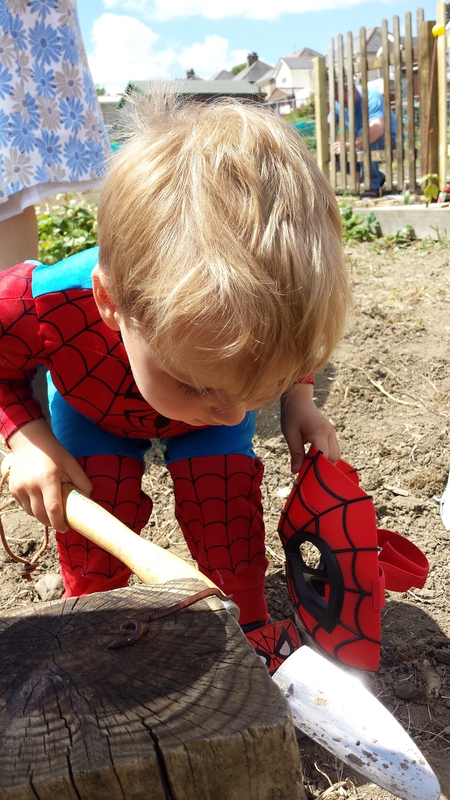 😉 I’ve been working like mad to try and clear plot 4A and today a group of Super Heroes lent a hand for and hour or so…Superman, Spiderman and the Princess! 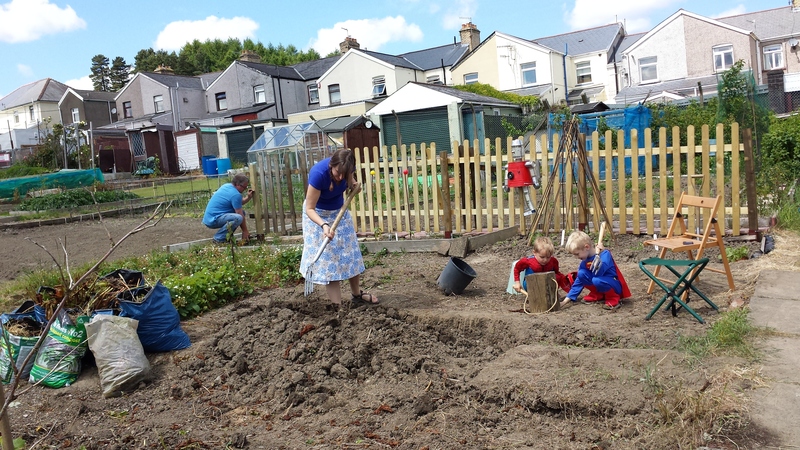 4A is beginning to look like an allotment instead of a wilderness garden! Hard work is beginning to pay off! …not one of my virtues. 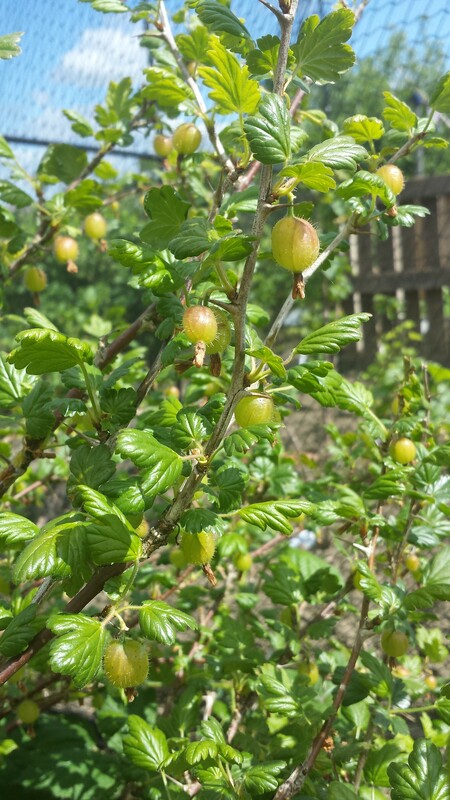 Plants Hardening off – now planted! 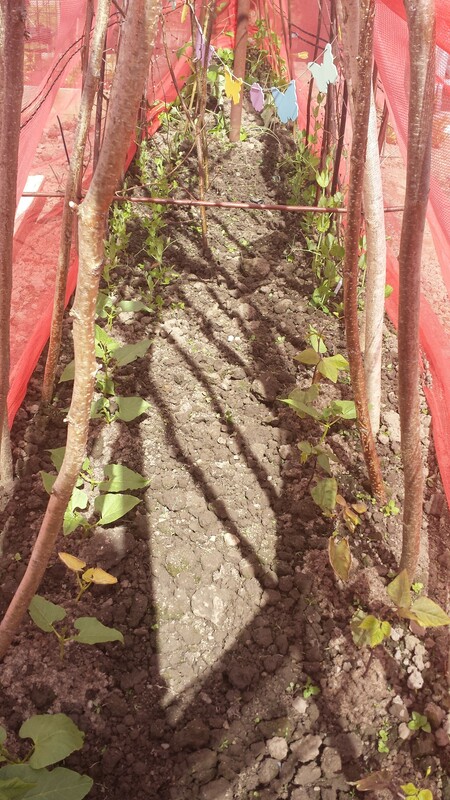 Climbing beans, runner beans and peas toughing it out! 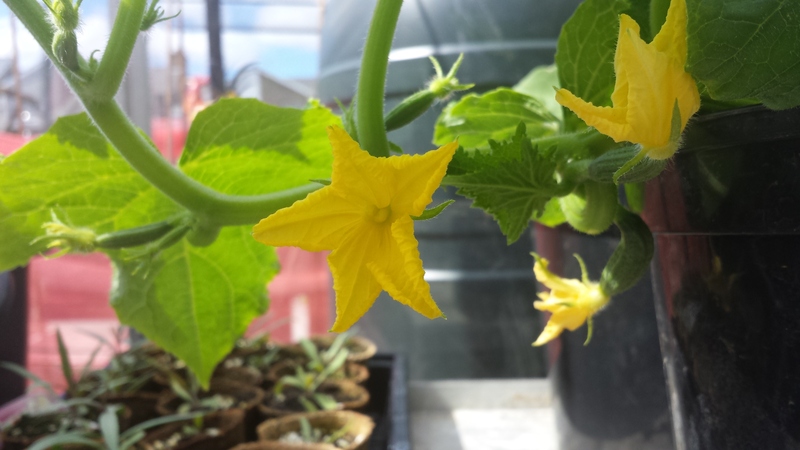 Mini Cucumbers are growing fast! I’ve read all about growing a mix of crops to slow down the need for maintenance. The peas, beans, carrots, onions, beetroot, garlic, artichokes…. etc haven’t needed a great deal of fussing, thank goodness, however, the weeding / pest clearing seems to be never ending! Flower bed is filling up. 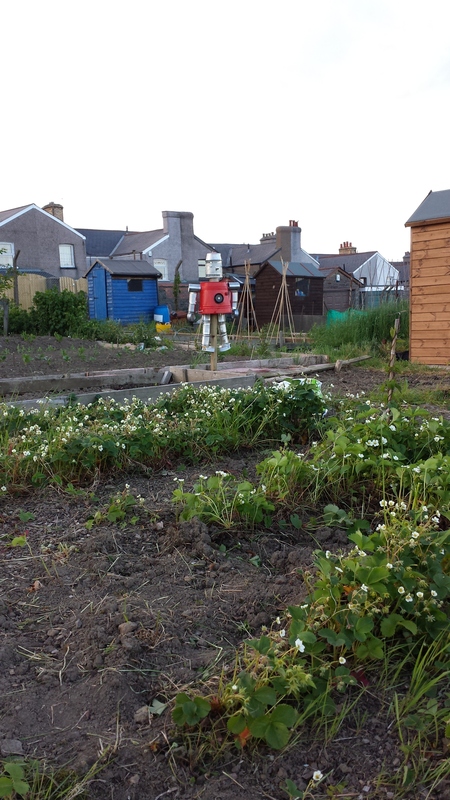 The scarecrow ‘Worzel Scrappage’ is guarding the strawberries.